Myself, along with other members of The Basildon Academies Sixth Form, are proud to have taken part in the 'Lessons from Auschwitz' project, run by The Holocaust Educational Trust. At the start of the project we had the amazing opportunity to meet Steven Frank, a Holocaust survivor, who told us about his life and the horrible moments he experienced as a child during World War 2. We learnt that the exclusion of Jews started by making them carry ID that showed their religion. Their treatment over time became more severe as they weren’t allowed to have contact with anyone other than those of the same religion, being forced to wear a yellow star on their clothes as identification. The week after meeting Steven, we visited Auschwitz in Poland. Whilst standing in the picturesque town square, we were handed historic photo’s showing Jewish people who had arrived in Auschwitz just before they were taken to the concentration and extermination camps. From the pictures you could tell that most of them had nice clothing, bags, hats and accessories, which clearly shows that they had no idea where they were being sent. Our next destination was Auschwitz I, a camp where prisoners were made to work or were killed when they couldn’t work anymore. Going through the barracks and seeing so many personal belongings had a big impact on me. There were shaving utensils which shows that even if they had a rough time they were still trying to keep themselves clean and presentable. The most emotional part was the gas chamber, the inside of it looked very depressing and morbid. 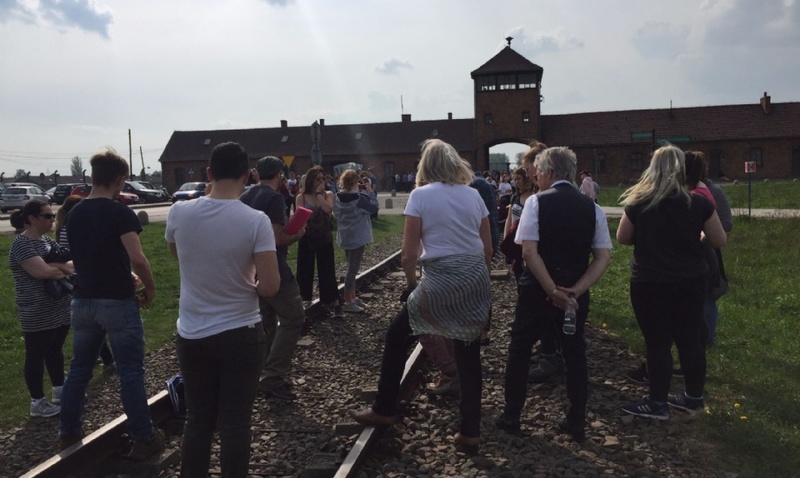 The tour continued to Auschwitz II-Birkenau, an expansive site. Each individual barrack accommodated 800-1000 Jews in an area designed to originally house just 52 horses. During a special ceremony, a rabbi sang to us in Hebrew. I can’t explain in words how much I loved and was moved by his voice, even if I couldn’t understand the language. Our project group have met since to reflect on our experiences and discuss how we can share our knowledge with other people and make sure this never happens again. Having the opportunity to visit Auschwitz and listening to a Holocaust survivor is a once in a lifetime experience which I will never forget.